With less than a week to go until a wide-ranging package of across-the-board budget cuts is set to kick in, President Obama today entreated the nation's governors to help him convince Congress to compromise on a deal to avert the so-called "sequestration," predicating his plea on the fact that as governors, "you know that compromise is essential to getting things done." Mr. Obama, speaking to the National Governors Association this morning at the White House, reiterated his warnings about the impact the cuts will have on the nation's economic status, and accused Congress of threatening "to allow a series of arbitrary automatic budget cuts to kick that will slow our economy, eliminate good jobs, and leave a lot of folks who are already pretty thinly stretched scrambling to figure out what to do." Who's responsible for the sequester? "These impacts will not all be felt on day one, but rest assured, the uncertainty is already having an effect," the president said. "Companies are preparing layoff notices, families are preparing to cut back on expenses, and the longer these cuts are in place, the bigger the impact will become." The cuts, which are spread equally between defense and non-defense discretionary spending, are set to go into effect on March 1. Economists have warned that allowing them to continue unabated could push the nation into another recession, and the Obama administration recently unveiled an in-depth analysis of the various programs that would be impacted. "These cuts do not have to happen. 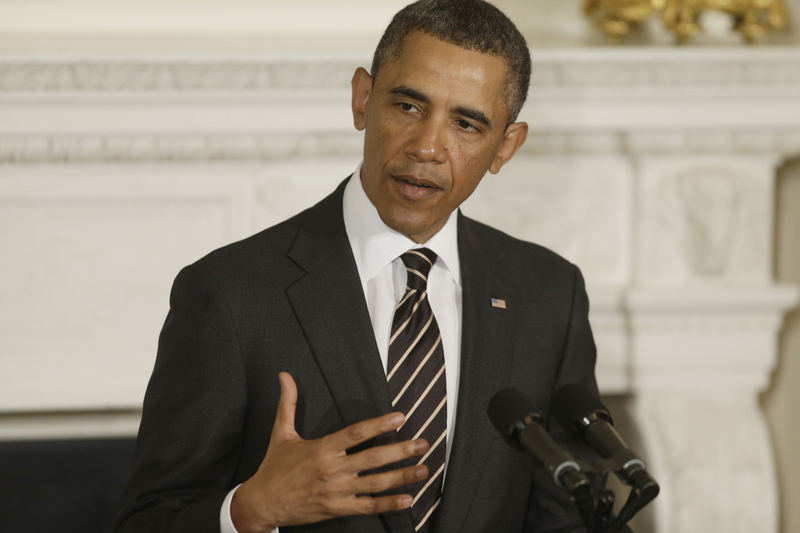 Congress can turn them off anytime with just a little bit of compromise," Mr. Obama said. "While you are in town I hope that you speak with your congressional delegation" and remind them what's at stake. In recent weeks, as the president ramps up efforts to facilitate a deal to avert the sequestration, he's been pushing an alternative deal that would make some budget cuts while overhauling the tax code to bring in additional revenue. "Democrats like me need to back 'modest reforms in Medicare...I've made that commitment," the president said. "We also need Republicans to adopt the same approach to tax reform that [House] Speaker [John] Boehner championed just two months ago... Under our concept of tax reform, nobody's rates would go up, but we'd be able to reduce the deficit by making some tough, smart spending cuts and getting rid of wasteful tax loopholes that benefit the well off and the well-connected." House Republicans are not likely to accept such a plan. During a press conference this afternoon, Speaker John Boehner, R-Ohio, suggested no new ground has broken between Republican leaders and the president, and maintained that any tax reform efforts should go toward lowering the tax rate rather than bring in additional revenue. Asked whether sequestration at this point is a definite, though, he repeated a line Mr. Obama used last week: "Hope springs eternal." "The president could sit down with Harry Reid tonight and work with Senate Democrats who have the majority in the Senate to move a bill," Boehner said. "It's time for them to act."